What do you think of when you think of Europe? France? The United Kingdom? Greece? Spain? Do you think of the Republic of Macedonia? If you did, you’d think of a relatively untouched and underrated territory. You would think of Mother Teresa, whose heritage is Albanian but was born in Macedonia. You would think of Cleopatra, who was related the Macedonian ruler Alexander the Great—one of the most renowned military commanders in history. You could also envision grandmothers working in vast fields and people whose health-care system is so poor they still pour brandy on fresh wounds. You could think of a country that has its own language using the Cyrillic alphabet, and a tight visa policy, which is why most of my family still lives there. When people ask my nationality, rarely have they heard of Macedonia—and if they have, they think we’re Greek or Albanian. I can’t avoid this question, but I also can’t dismiss my heritage, despite having grown up a more privileged life as a first-generation American. But since I can’t ignore, it I figured I should visit again to experience my home country as an adult. In August 2016, I decided to give my roots a second chance. After setting down in the forgotten land, I headed for my parents’ hometown and the second-largest city, Bitola. On the top floor of the house there is a terrace overlooking the city; outside, a sink to wash my hands and a canopy made of vines and grapes for shade. I stepped out onto the small, poorly paved streets, past the broken-down homes and toward the daily outdoor summer market, where I could buy inexpensive shoes and ingredients for a shopska salad. 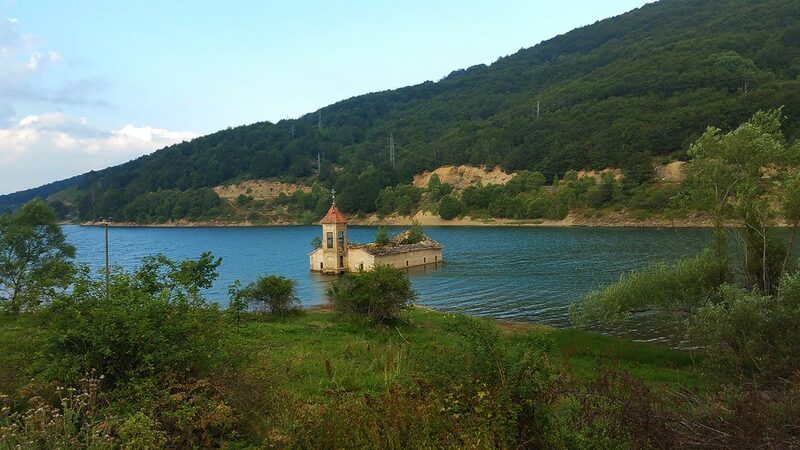 The semi-submerged Church of St. Nicholas is an icon of Mavrovo National Park. Bitola’s main strip isn’t very long, and after my shopping I strolled through all of it in about an hour. It’s riddled with busy restaurants, antique shops, cafés selling Turkish coffee, Macedonian nightclubs and retailers hawking clothes that looked more fashionable than the embroidered Balkan dance uniforms I was forced to wear as a child. After a few days, I wanted to venture beyond the city limits to see more of the country. All Macedonia’s major cities are at least an hour apart, so I was lucky that my family was willing to chauffeur me around. The long car rides took us through mountains, farms, villages, mosques and plenty of water wells, in case we needed to wash some fruit or enjoy a refreshing drink. Well, to the locals the water is refreshing; I didn’t want to be rude, so I drank when it was offered, but when I had the chance I stuck to bottled water. One road trip was to Skopje, Macedonia’s capital. I had no memory of it from my youth, except of its shack of an airport, which had wonderfully improved. Now the city centre was filled with monumental statues of anti-Ottoman revolutionaries, water fountains, hotels, beggars and a bazaar. 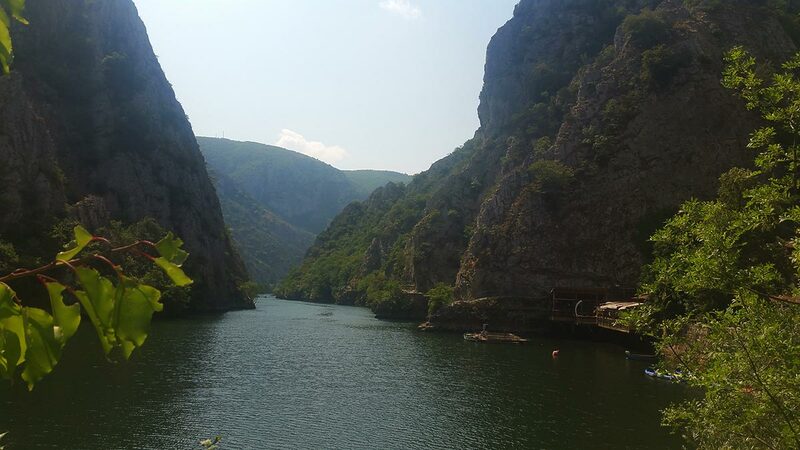 The city’s real gem is nearby Matka Canyon, where halfway to the top sits a chapel and a quaint hotel sheltering tourists. There were few tourists when I last visited a decade ago, but that was changing, and Macedonians don’t love the idea of tourism despite what it could mean for their economy. We took a detour on the way back to Bitola, driving west toward the Albanian border, to Mavrovo National Park. If you drive long enough into the depths of the forest, you can find the Church of St. Nicholas, abandoned and half submerged underwater. 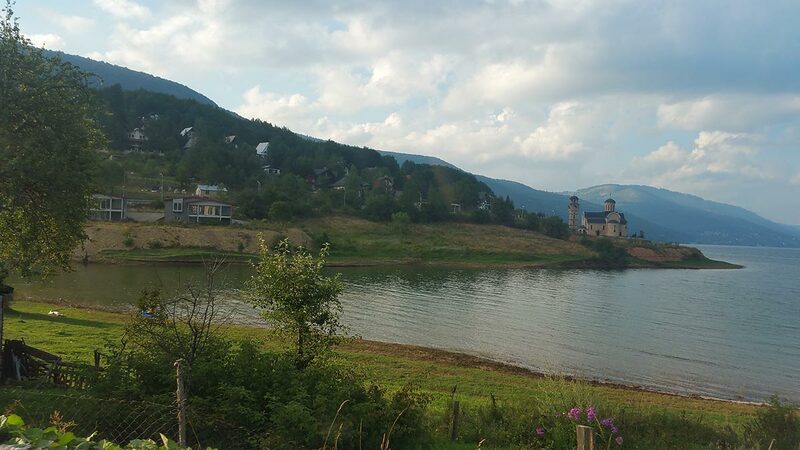 Farther south, we stopped at Saint Jovan Bigorski Monastery, where villages sit nestled into the mountains up high. Ohrid is a popular vacation spot in Macedonia’s southwest. Then finally came the day when we drove to Ohrid, a small lakeside resort town. I spent the night in a waterfront hotel for US$20 and met up with my cousin from America. We started the evening by eating some good ol’ kebabki and soda, because my cousin agreed with me about the water. Then we made our way through some clubs before realizing what we really needed to do was go to the liquor store, grab a bottle of wine, sit ourselves on the side of the lake and just talk. We stayed out until 4 a.m. and woke up abruptly when the hotel owner kicked us out only a few hours after we’d gone to sleep because she needed to clean the room for the next guest. My next stop was Sveti Naum, a magical spot on the southern end of Lake Ohrid. The last time I visited Sveti Naum I remember the clear water, barbecues and pristine soil. Now the water levels were higher, disappearing the ground on which we used to lay out. The main complex was completely redone with peacocks floating around the boat-accessible lagoon. Although it was renovated, it still hadn’t lost its tranquil feel. We made our way to the monastery atop the main cliff. We crossed ourselves three times before entering. Walked inside. Lit a candle. Dropped money into the donation box. Crossed ourselves three more times and kissed the centuries-old frescoes. Then, as we walked out of the saint-painted dome, we made our way into the room where Saint Naum is buried. Crossed ourselves yet again and kneeled down to hear his muffled heartbeat. 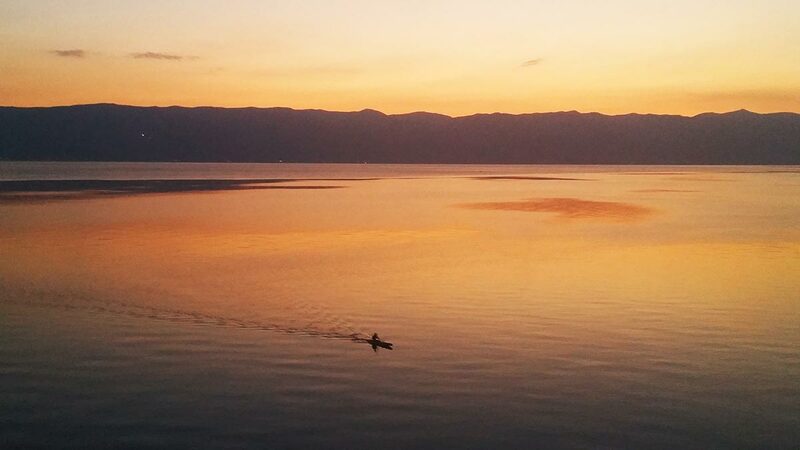 Macedonia’s natural beauty is still largely unknown to mainstream travellers. Afterward we admired the peaceful views and envied the guy rowing his canoe deep in the lake. Of all the places I have travelled, this spot remains my favourite. It’s instant therapy for the soul. No action required. It was there I realized that Macedonia might not have the greatest economy on Earth, but it’s a natural beauty. The trees. The countless gardens wrapping romantic houses. The little kids running barefoot in the streets. The lakes. The streams. The small cars. The abandoned buildings. The simple life. It’s a well-kept secret. However, this secret is becoming more popular. Tourism numbers have grown every year since 2010, with nearly 70 percent more tourists in 2016 than in 2005. But despite Macedonians not loving their country’s growing popularity, I believe it’s a good thing. Macedonia is a historically rich country, and hopefully this newfound adoration will expose the social difficulties it goes through and showcase an inexpensive lush summer vacation to curious travellers. Sure, tourism has its downfalls, and it will probably be a little sad for me, years from now, to see an influx of money and rapidly changing infrastructure. But for now, just because it’s poor, doesn’t mean it is isn’t beautiful. In fact, that’s probably what makes it even more beautiful. Tatiana was born and lives in New Jersey. She enjoys travelling, yoga and concerts. She is a millennial who wants nothing to do with her college major, and is instead pursuing her interest as a writer. Will 2018 Be the Best Summer Ever for Cheap Transatlantic Flights? The Answer is…No, But Maybe Next Summer!